The general arrangement of the room. The important factors are the source or sources of light, and the lines of travel. The common arrangement of benches where two sides of the room are lighted, is shown in a, Fig. 238. 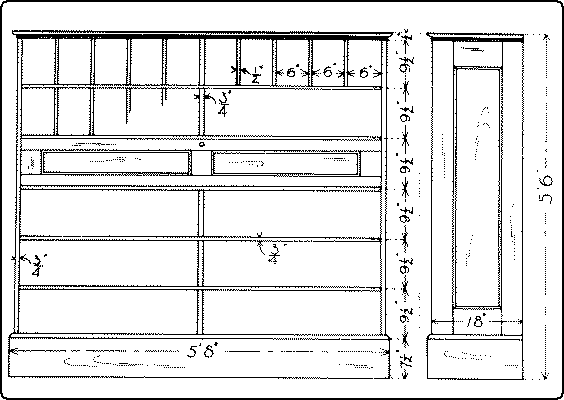 By this arrangement, as each worker faces his bench, he also faces one set of windows and has another set of windows at his left. The advantage of this arrangement is that it is easy to test one’s work with the try-square by lifting it up to the light. Another arrangement, shown in b, Fig. 238, has this advantage, that there are no shadows on the work when it is lying on the bench and the worker is holding his rule or try-square on it with his left hand. When all the windows are on one side of the room the latter is the more advantageous arrangement. In determining the position of the benches, especially with reference to their distance from each other, thought should be given to the general lines of travel, from the individual benches to the general tool-rack, to the finishing-table, to the lockers, etc. Even if all the aisles cannot be wide enough both for passage and for work, one wider one thru the center of the room may solve the difficulty. 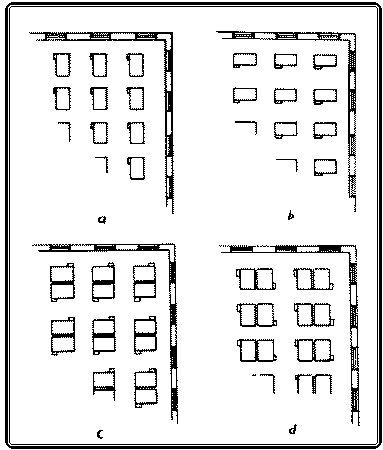 Where rooms are crowded, space may be economized by placing the benches in pairs, back to back, c and d, Fig. 238. In any case, room should always be reserved for a tier of demonstration seats, facing the teacher’s bench, for the sake of making it easy for the pupils to listen and to think. Fig. 238. Four Different Arrangements of Benches in a Shop. The Tools. Every shop soon has its own traditions as to the arrangement of tools, but there are two principles always worth observing. (1) It is an old saying that there should be “a place for everything and everything in its place.” This is eminently true of a well-ordered woodworking shop, and there is another principle just as important. (2) Things of the same sort should be arranged together, and arranged by sizes, whether they be general tools or individual tools. In arranging the rack for general tools, a few suggestions are offered. In the first place, arrange them so that there will be no danger of cutting one’s fingers on one tool when attempting to take down another. Where the rack must needs be high, all the tools can be brought within reach, by placing long tools, like files, screwdrivers, etc., at the top. Such an arrangement is shown in Fig. 239. Fig. 239. General Tool rack in a School Shop. 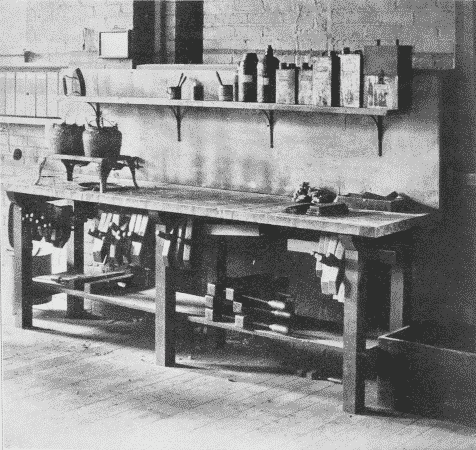 As to the individual benches, those without high backs are to be preferred, not only because of their convenience when it is desired to work on large pieces, like table tops, and because the backs do not interfere with the light, but because it is easier for the teacher to look over the room to see that everything is in order. If the equipment is kept complete, it is an easy matter to glance over all the benches and the general rack to see that everything is in place. In general, there are two methods of keeping guard over tools, the open and the closed. In the open method, everything is kept in sight so that empty places can be discovered readily. This method is a convenient one, and, besides, the tools are always easily accessible. 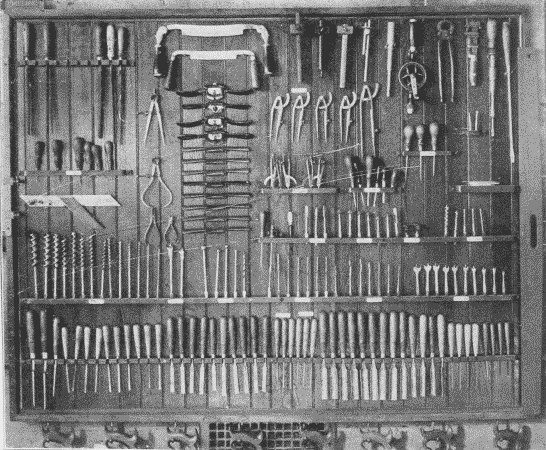 In the closed method, the tools are kept in drawers and cases where they can be locked up. This method is suitable where pupils are equipped with individual sets of cutting tools. 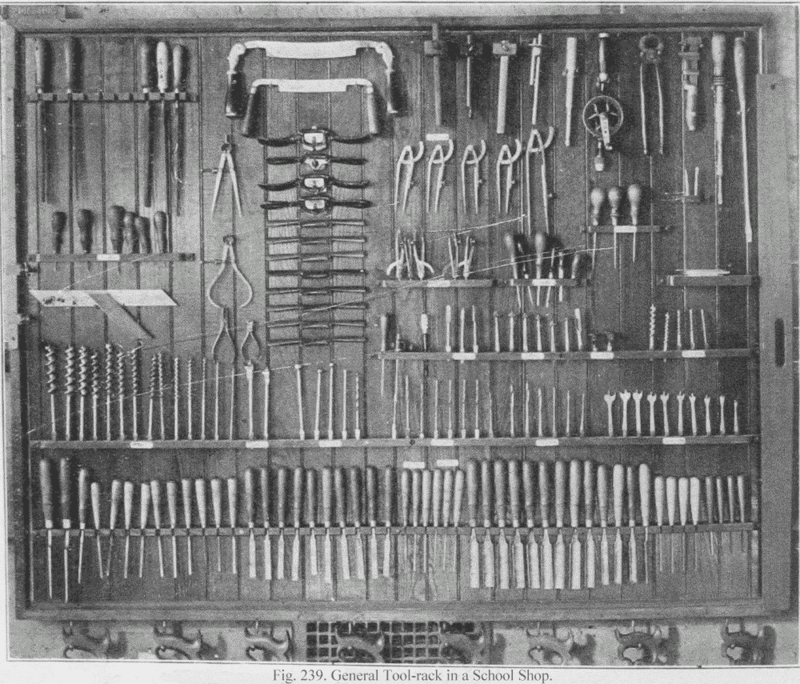 In such a case, the common tools for each bench are kept in a common drawer and individual pupils’ tools in separate drawers. This method has the disadvantage that things are out of sight, and if they disappear their loss may not be discovered immediately. On the other hand, where the drawers and cases are kept carefully locked, the danger of loss is reduced almost to a minimum. Sometimes a combination of both methods is tried, the tools being kept in unlocked drawers. This method furnishes the greatest difficulty in keeping tools from disappearing. Even when tools are well arranged, one of the most serious difficulties in the way of shop order, is to keep tools in their places. Pupils who are in a hurry, slip in the tools wherever they will fit, not where they belong. Labels at the places of the different sets may help somewhat; a more efficient method is to paste or paint the form of each tool on the wall or board against which it hangs. Pupils will see that, when they will not stop to read a label. In spite of all precautions, some tools will disappear. A plan to cover the cost of these, which works well in some schools, is to require a deposit at the beginning of the year to cover these losses. Then at the end of the year, after deducting the cost of losses, the balance is returned pro rata. There is diversity of practice in the distribution of tools on the general case and on the individual benches. Some tools, like the plane and chisel, and try-square, are so frequently in use that each worker must have one at hand. As to others, the demand must determine the supply. One other consideration may be expressed by the principle that those tools, the use of which is to be encouraged, should be kept as accessible as possible, and those whose use is to be discouraged, should be kept remote. Some tools, like files, it may be well to keep in a separate locker to be had only when asked for. 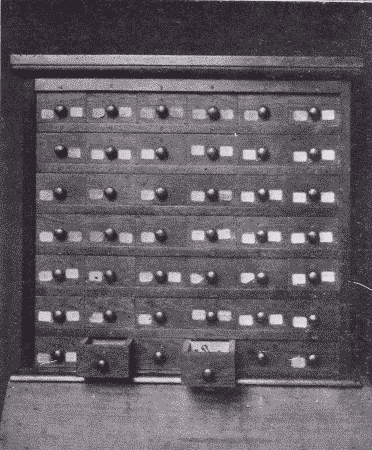 A cabinet of drawers, such as that shown in Fig. 240, for holding nails, screws, and other fastenings, is both a convenience and a material aid in preserving the order of the shop. Fig. 240. Nail and Screw Cabinet. As for the care of tools during vacation, they should be smeared with vaseline, which is cheap, and put away out of the dampness. The planes should be taken apart and each part smeared. To clean them again for use, then becomes an easy matter. The best method of removing rust and tarnish is to polish the tools on a power buffing wheel on which has been rubbed some tripoli. They may then be polished on a clean buffer without tripoli. The Lockers. In order to maintain good order in the shop, an almost indispensable part of the equipment is a set of lockers for holding the unfinished work of pupils. An inexpensive outfit may consist simply of sets of shelves, say 5″ apart, 12″ deep, and 18″ long, Fig. 241. Ordinary spring-roller curtains may be hung in front of each set of shelves to conceal and protect the contents. Such a case should cost at the rate of about 40c. for each compartment. A more substantial and more convenient case, shown in Fig. 242, consists of compartments each 9½” high, 6″ wide, and 18″ deep. These proportions may be changed to suit varying conditions. In front of each tier of 12 compartments is a flap door opening downward. 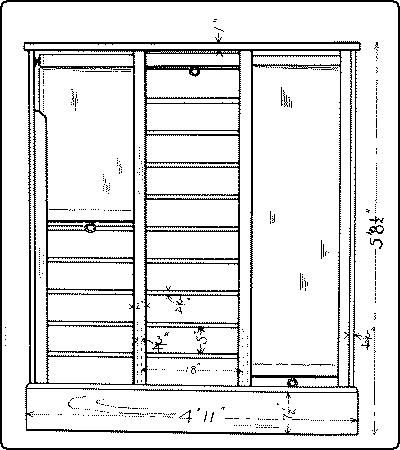 Such a case built of yellow pine (paneled) may cost at the rate of $1.00 per compartment. Fig. 241. An Inexpensive Locker for Unfinished Work. Fig. 242. A More Expensive Locker for Unfinished Work. 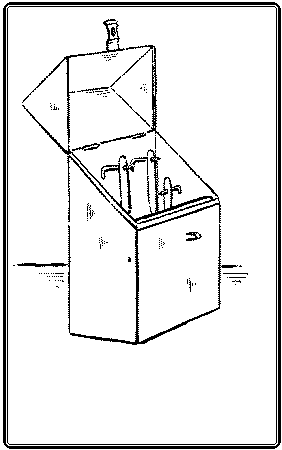 There should, of course, be a separate compartment for each pupil using the shop. Where possible, there should be a special table for staining and gluing. Where strict economy must be practiced, a good sized kitchen table covered with oilcloth answers every purpose. A better equipment would include a well-built bench, such as that shown in Fig. 243, the top and back of which are covered with zinc. Fig. 243. 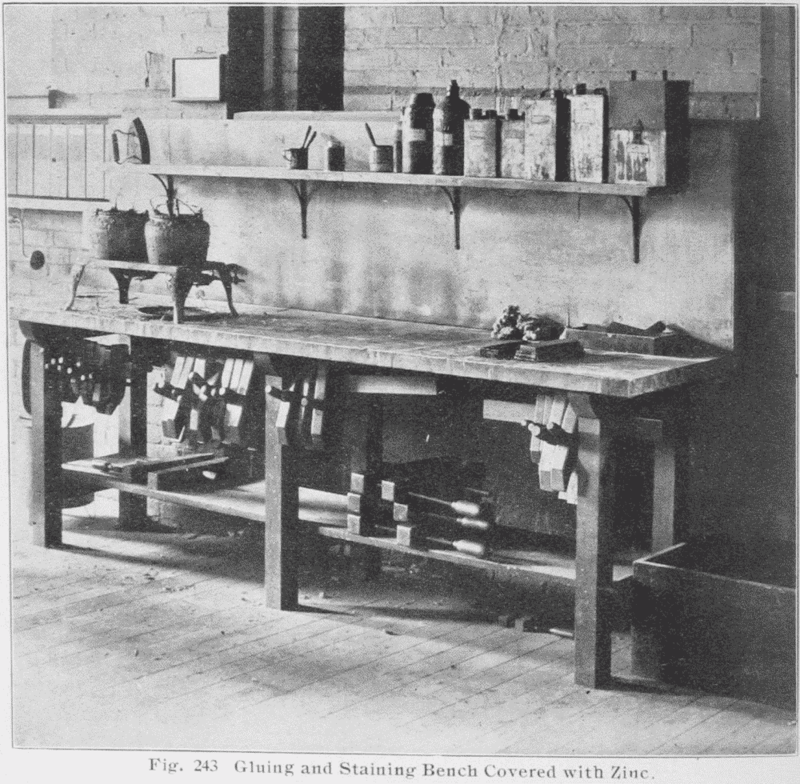 Gluing and Staining Bench Covered with Zinc. Where no staining-table is possible, temporary coverings of oilcloth may be provided to lay over any bench which is convenient for the purpose. Care of brushes and materials used in finishing wood. Shellac should be kept in glass or pottery or aluminum receptacles but not in any metal like tin, which darkens it. A good plan is to have a bottle for fresh, untouched shellac, a wide-mouthed jar for that which has been diluted and used, and an enameled cup for use. There should also be a special brush, Fig. 244. At the time of using, first see that the brush is soft and pliable. If it is stiff, it can be soaked quickly and softened in a little alcohol in the cup. This alcohol may then be poured into the jar and mixed in by shaking. Then pour out a little from the jar into the cup, and if it is too thin, thicken with some fresh shellac. After using, pour back the residue into the jar, carefully wiping the brush on the edge of the jar; and if it is not to be used again for some time, rinse it in a little alcohol, which may also be poured into the jar, which should then be covered. What little shellac remains in the brush and cup will do no harm and the brush may be left standing in the cup until required. 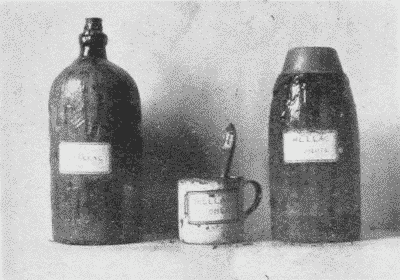 The important things are to keep the shellac cup and brush for shellac only, (indeed, it is a good plan to label them “SHELLAC ONLY,”) and to keep the shellac covered so that the alcohol in it will not evaporate. In a pattern-making shop, where the shellac cup is to be frequently used, it is well to have cups with covers thru which the brushes hang, like the brush in a mucilage jar. Varnish brushes need to be cleaned thoroughly after each using. If they get dry they become too hard to be cleaned without great difficulty. Brushes for water stains are easily taken care of by washing with water and then laying them flat in a box. Cups in which the water stains have been used can also be easily rinsed with water. Brushes for oil stains are most easily kept in good condition, by being hung in a brush-keeper, Fig. 245, (sold by Devoe & Reynolds, 101 Fulton St., N. Y. C.) partly filled with turpentine. The same brushes may also be used for fillers. Oil stains should be poured back into their respective bottles, and the cups wiped out with cotton waste. When they get in bad condition, they can be cleaned readily after a preliminary soaking in a strong solution of potash. The same treatment may be given to brushes, but if they are left soaking too long in the solution, the bristles will be eaten off.